thanks in large part to generous support from players of People’s Postcode Lottery. And it’s been bliss to get out on foot during the sunniest summer in decades. this is the path network, envied around the world, and a vital resource not just for ramblers, but for millions of others in their daily lives and leisure activities. 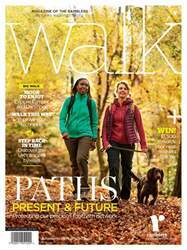 This edition of walk celebrates Britain’s fantastic footpaths, and asks you to help secure their future. Explore miles of magical paths in our regular Ten Places, Ramblers Routes, Discover and Big Walk features. 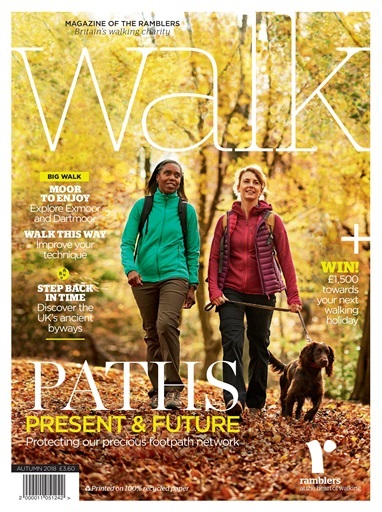 Then turn to p30 to read about our Your Path Awaits campaign to protect the nation’s path network. As the UK prepares to leave the EU, and politicians negotiate a domestic alternative to the Common Agricultural Policy, we need to make sure our precious paths are protected. That’s why we’re calling on every Ramblers member to become a path protector. If you love to spend time walking, please take a minute to sign up at ramblers.org.uk/YourPathAwaits.